Fooditka: Fooditka in the NY Daily News! 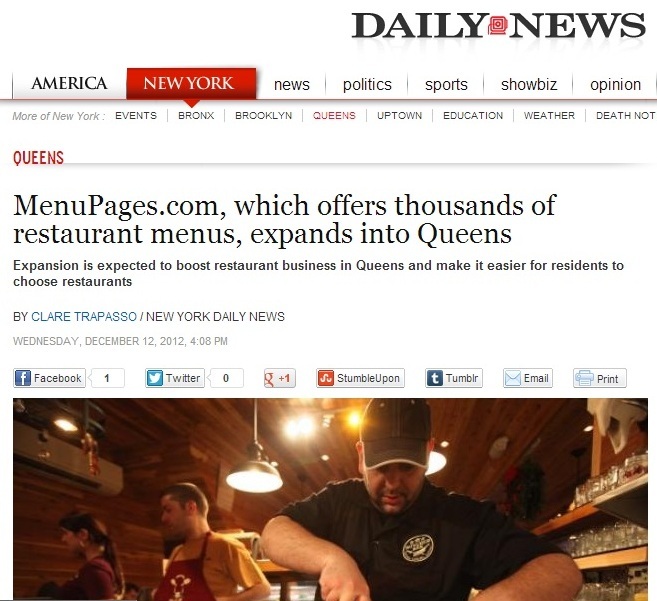 Fooditka in the NY Daily News! There's two great pieces of news I wanted to share with you: 1). is that Menupages has launched in Queens (this is huge!) and 2). that I'm featured in the NY Daily News article that mentions it. I was excited to be interviewed by reporter, Clare Trapasso, lending her my thoughts on why I think the launch of this site will make an impact in Queens. As a total good food junkie, I've always looked to Menupages as a resource and aside from the actual menus (and prices), which are so helpful, I also appreciate the user-generated reviews. But what's even better, as Clare points out in the article is that readers can easily connect to Menupages' partner, Seamless for instant gratification - as in...scope out your goods and then have the immediate option to buy them. It's great to see a really huge Astoria restaurant representation on the site, and I've already spotted some of my faves such as Astor Bake Shop, Basil Brick Oven Pizza, Queens Kickshaw, Koliba and much more. Feel free to check out this new and exciting feature of their site - you won't have to search for menus anymore. Read the entire NY Daily News article.